If you don’t want to spend £850+ on the Concept 2 Model D, but still want a great rowing machine for your home, this is the perfect alternative. Here’s our JTX Freedom Air Rower. The JTX Freedom Air Rower mimics the Concept 2 Model D and uses a combination of electromagnetic and air-based resistance. This gives the machine a smooth action that comes close the replicating the feel of oars through water. See also: Best home rowing machine 2017: The 5 BEST indoors rowing machines for ANY budget. It comes with 18-levels of resistance, meaning rowers of all abilities can use the JTX Freedom Air Rower to find a level that challenging for them. 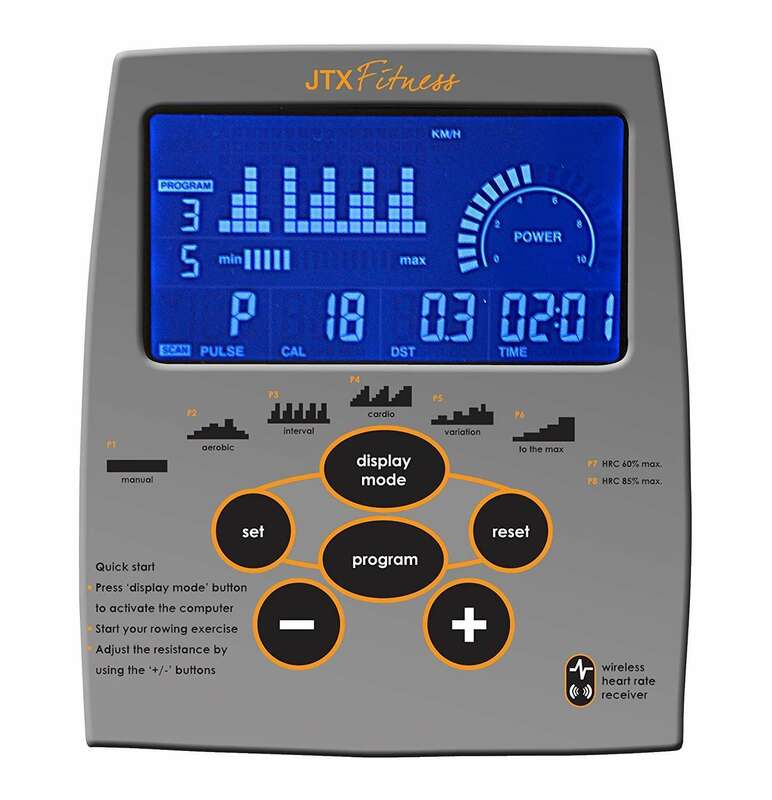 JTX includes a free heart-rate monitor with the Freedom Air Rower. This wirelessly syncs up with the machine’s monitor and will display your beats per minute (BPM). It’s a real plus point for users as it lets you know exactly how hard you’re working and which training zone you’re in. As a general rule, a light workout is considered to be within 65%-75% of your maximum heart rate, while a moderate-to-heavy workout is when your BPM is between 65%-75% of your maximum. Your maximum heart rate is 220 minus your age. The backlit monochrome monitor displays all the data you need for a good rowing workout including Speed, Distance, Stroke, 500m Split Time, Revolutions, Time, Torque or Power, Strokes/Minute, and Heart Rate. Navigation through the monitor’s modes is made easy thanks to six large physical buttons that are hard to miss (important when you’re sweaty from a workout). The only downside here is that there is no smartphone connectivity, meaning workout data cannot be stored. Don’t be put off by this monitor’s simple looks. All rowing machines, including the Concept 2 and WaterRower, have basic monitors that lack imagination or simple smartphone integration. So consider this machine’s monitor on a par with the industry. The JTX Freedom Air Rower is made from a reinforced aluminium frame that supports up to 130kg (20 stone) of body weight. Like all good home rowers, it features a collapsible design for easy storage, as well as built-in wheels for ease of movement. See also: Concept 2 vs WaterRower: We pitch the Model D against the Natural Rowing Machine. Some users have noted that the machine can slightly lift/move when they have rowed vigorously, but this can be solved by placing small weights on the far side. The machine comes with a generous 2-year warranty on all parts and includes labour. In general, the vast majority of customers won’t need to use this. However, those that have experienced problems are complimentary of JTX’s customer service. The company has a Five-star “Excellent” TrustPilot based on 470+ reviews. See also: WaterRower Natural Rowing Machine Review: The BEST looking rowing machine you can buy. The JTX Freedom Air Rower is a fantastic rowing machine that’s really well priced. It’s probably a little behind the Concept 2 Model D in terms of build quality and overall design. But it’s a lot cheaper. And it’s quality action is fantastic for rowers of all abilities. Read next: JLL R200 review: A basic and cheap rowing machine. Dyson Supersonic vs GHD Aura comparison review: Which is the better hairdryer? Mahabis Classic 2 review: I bought the slippers you’ve seen on Facebook!